After an over 50 year absence from Pennsylvania, federally endangered bird, the Great Lakes piping plover has returned to the Gull Point Natural Area at Presque Isle State Park, building two nests after their long holiday from Erie. Slightly larger than the sparrow the piping plover is one of the rarest birds in our region and only found in three locations in the world: the Atlantic Coast, the Northern Great Plains where they are protected as threatened, and the Great Lakes where they are protected as endangered. The world-wide piping plover population are up to a little over 4,000 pairs, having hit an all-time low in the 1980s when only 17 breeding pairs were left. Declines in population for the piping plover are due to increasing interference from development and human traffic on beaches. Predation is also a factor in the endangerment of the bird species. 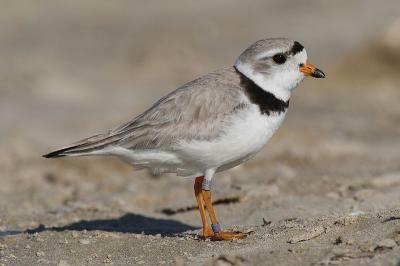 "The return of nesting piping plovers to the Lake Erie shoreline demonstrates the resolve of the Game Commission and its partners to expand Pennsylvania's wildlife community and bring back what time and imprudence had taken from the Commonwealth," noted Game Commission Wildlife Diversity Program Chief Dan Brauning. "It is invigorating to see more endangered species making a comeback." The development of these two nests point to the piping plovers recolonizing Lake Erie, which in turn shows positive developments for Presque Isle as a whole and the work locals have been putting into restoring the area. "This is a testament to dedication and teamwork, not only in Pennsylvania but throughout the species' range," said Brauning. "Their return wasn't by chance, or an accident." Game Commission biologist, Cathy Haffner, has been working with the Great Lakes piping plover recovery efforts since 2001, said in a statement,"Many have worked tirelessly for years throughout the piping plover's range to bring this bird back from the brink of extinction and it certainly is paying off." Haffner found in a 2007 recovery assessment about the Pennsylvania piping plover, that woody and invasive vegetation removal along the shoreline would improve recolonization potential, among other things. And that's what Presque Isle did. After the removal of the invasive plants shorebird (what the piping plover along with other species) abundance nearly tripled Sarah Sargent the Audubon Pennsylvania bird conservation program manager explained. "The return of breeding plovers to Pennsylvania's Lake Erie shoreline is truly historic," said Vince Cavalieri, a USFWS biologist who coordinates Great Lakes piping plover management. "We had plovers nesting on all five of the Great Lakes at once for the first time since 1955. The return of breeding plovers to Lake Erie and Lake Ontario in recent years is a major milestone in the recovery of this species."